Twenty-five years ago, the main players in the cruise industry operated a fleet of around forty ships offering berths for some 37,000 passengers. Today, the same players operate a fleet of around 125 ships capable of carrying in excess of 250,000 passengers at any one time. Not only has the industry grown almost seven-fold during that period but it has in effect divided into the best and the biggest, with seven or eight lines offering the best in service and experience and another seven or eight offering a seagoing experience on very large scale ships at more affordable prices. This week, we look at this phenomenon. Elsewhere, Norwegian Cruise Holdings has floated at a 30% premium and another SuperStar Gemini has made her maiden voyage. Twenty-five years ago, in 1988, the main cruise lines were Carnival, Cunard, Holland America, Norwegian America Line, Norwegian Cruise Line, Royal Caribbean Cruise Lines and Royal Viking Line. 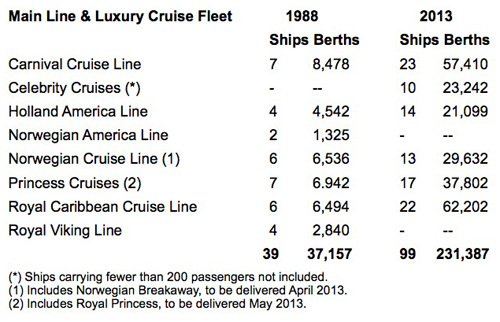 Of these seven, only two, Norwegian America and Royal Viking Line, have fallen away, consolidated into Cunard. But half a dozen new lines have arisen. In 1988, Seabourn had introduced its first ship, the 212-berth Seabourn Pride, and four more lines follow over the years with Crystal Cruises, Regent and Silversea, all ultra-luxury, and more recently Oceania and Azamara in the ultra-premium sector. The former Chandris Cruises, meanwhile, evolved into Celebrity Cruises, which was taken over by Royal Caribbean in 1997. 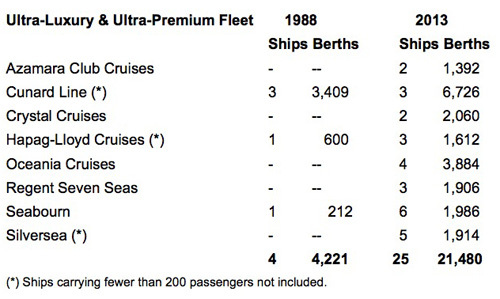 Of the lines we have chosen, it might be surprising to some that in 1988 the fleet numbered only 39 ships with 37,157 berths (42 and 40,566 berths if we include Cunard), especially as in 2013 the top eight ultra-luxury and ultra-premium lines together operate 25 ships with 21,480 berths. In this context, today’s ultra-luxury and ultra-premium fleet is more than half the size of the entire main line and luxury fleet of twenty-five years ago. The biggest difference, however, is in the size of the ships. Although the 1988 average was below 1,000 berths per ship this was the beginning of a period of growth, not only in number of berths (Princess Cruises’ 62,500-ton Star Princess, which seemed big then, had only 1,470 berths), but ships started to grow in tonnage as well. The average ship size for the main-market lines grew from about 950 berths to 2,335 berths, or almost two-and-a-half times per ship. And the size of ultra-luxury and ultra-premium ships has risen from 212 in the Seabourn Pride to about 670 today if we do not include Cunard, or more than three times the size. Other lines such as Costa Cruises and Chandris Cruises, with six ships each, the 10-ship Epirotiki Lines and a single-ship (at the time) P&O Cruises have not been included in this analysis, but obviously Costa and P&O have both benefitted in terms of fleet expansion from being taken over by Carnival Corp, now Carnival Corp & plc. All in all, despite wars, terrorism, disease and economic dislocations, the industry as a whole is surviving and seems to be surviving well if we can judge by cruise line stocks as well as fleet size (see next story). The recent flotation of Norwegian Cruise Line Holdings on the Nasdaq in New York last Thursday has been sold out at a price of $19, which was above original ideas of $16-18. Shares opened above $24, a premium of about 30% and have since been trading above $27, a premium of more than 40% on the sale price. In the process, Norwegian has raised $447 million, which will go towards making payments against a cash credit facility, various other debts on vessels in the fleet and a $79.7 million payment to Genting Hong Kong towards Norwegian’s acquisition of the Norwegian Sky from Star Cruises. After this offering, Genting Hong Kong’s ownership in Norwegian Cruise Line is 44%, with private equity firms Apollo Global Management owning 33% and TPG Capital 11%. New York-based Apollo first bought a half interest in Norwegian from Genting Hong Kong in January 2008 for $1 billion and Texas-based TPG Capital subsequently acquired a quarter of Apollo’s interest. Apollo also controls Prestige Cruise Holdings, which owns Oceania Cruises and Regent Seven Seas Cruises. After a long lay-up of four years, the former 1,500-berth Norwegian Dream has re-emerged this month as Star Cruises’ latest SuperStar Gemini, making her maiden cruise from Penang at the beginning of this month. As the Norwegian Dream, she had been part of a two-ship sale to Louis Cruises that also included the 1,462-berth Norwegian Majesty. 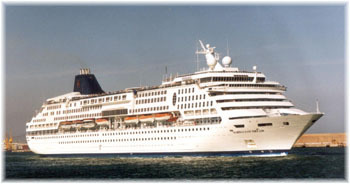 While the Norwegian Majesty was taken by Louis and is now trading under charter to Thomson Cruises as the Thomson Majesty, Louis refused delivery of the Norwegian Dream for technical reasons and she has been in lay-up at Freeport, Piraeus and more recently Singapore, since November 2008. The ship’s maiden voyage as SuperStar Gemini left Penang on January 6, under a charter to Kuala Lumpur-based Hwajing Travel & Tours. She is now offering cruises from Singapore calling at Ho Chi Minh City, Nha Trang and Hong Kong; and from Sanya, on Hainan Island, calling at Danang, Halong Bay and Hong Kong. From April to October SuperStar Gemini will be based at Shanghai, offering over thirty cruises to ports such as Cheju, Pusan, Fukuoka, Nagasaki, Kumamoto, Naha, Ishigaki and Keelung. A number of special chartered cross-strait itineraries from Shanghai to Taiwan have also been scheduled, subject to approval. From mid-October, SuperStar Gemini will cruise from Sanya to various ports in Vietnam and nearby. The first SuperStar Gemini, a 916-berth vessel, now trades for International Shipping Partners as the Gemini. She cruised for Star Cruises between 1995 and 2008 but has latterly been trading in the open charter market. The Gemini is presently laid up at Tilbury and available for charter or sale. Meanwhile, the new SuperStar Gemini’s sister ship, the former Norwegian Wind, has been sailing for Star Cruises since as the SuperStar Aquarius since 2007, so after more than five years the two 1990s-built sisters have finally been reunited.